Garnet can accept a fantastic polish - but most garnet is below tumbling grade. Premium grade garnets for tumbling. 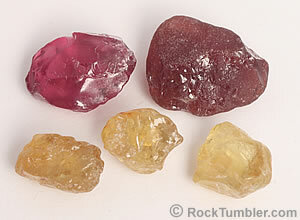 The stone on the top left is a pink rhodolite (about two grams), the top right is a red pyrope (about three grams), the three yellow stones are Mali garnets (about one gram each). Garnets like these can cost a dollar per gram or more. Most of what you need to know about tumbling garnet is summarized in the two ideas below. Read them two or three times and reflect. 1) The key to tumbling garnet is not in the procedure. It is in buying or collecting rough that will perform well. 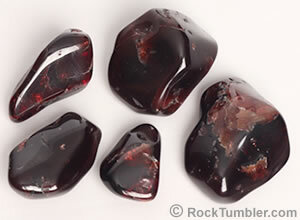 2) Most garnet is not worth tumbling - including much of what is currently being sold as "garnet tumbling rough." Lots of people get excited about polishing garnet. It is easy to understand their excitement. Garnet has been one of the world"s most popular gemstones for over a thousand years. The mineral occurs in a wide range of colors and it can be used to make beautiful tumbled stones. 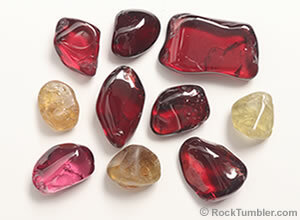 Garnet is one of the easiest materials to bring to a super-bright polish in a rock tumbler. But, before you get excited, here is the really bad news -- almost all garnet is below tumbling grade. The key to tumbling garnet is not in the procedure. It is in buying or collecting rough that will perform well. Wow! Look at those nice geometric crystals. I bet I can toss them in a tumbler and quickly turn them into beautiful gems! The dark color is a clue to the fact that these crystals have so many inclusions and so many fractures that light has a hard time getting through. These garnet crystals are about 3/4 to 1 inch across. They will be better as inexpensive mineral specimens than as ugly tumbled stones. Lots of people find deep red crystals with beautiful geometric shapes, learn that they are garnets, and assume that they can turn those crystals into beautiful polished gems in a rock tumbler. Then they spend a month processing those crystals in a rock tumbler. Their reward for that work is usually tumbled stones with a decent polish, but with a really ugly appearance. The stones are usually criss-crossed with unsightly fractures and/or covered with ugly pits. Most garnet is not worth tumbling - including much of what is currently being sold as "garnet tumbling rough." Many people have started with beautiful geometric crystals, and then, in the tumbler, every defect in the crystal is brought to the surface. Phooey! Click here to see clues that tell you that these crystals are not of tumbling grade. What Is "Below Tumbling Grade"? Tumbled garnets that display fractures that are typical of tumbled garnets. The large stone is about one inch in size. On this website when you see the words: "below tumbling grade" that is a warning. A warning about materials that are likely to waste your time, electricity, grit and polish in a rock tumbler. So, what is "below tumbling grade"? When a material is of "tumbling grade" that means that it can be used to produce nice tumbled stones. Some garnet is of tumbling grade and makes beautiful tumbled stones, but most garnet is "below tumbling grade" and makes ugly tumbled stones because it has one of the problems described below. 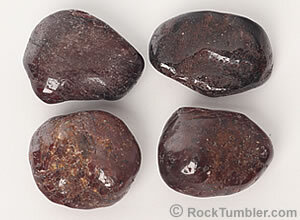 These garnets do not have a great polish because their surfaces are covered with tiny pits. Each pit marks the location of a surface-reaching inclusion. A great polish requires a perfectly smooth surface on the stone and that is often impossible when the garnet is loaded with tiny inclusions. These stones are about one inch in size. FRACTURES: Much garnet is fractured. These fractures might cause garnet crystals to break apart in the tumbler, or the garnet will survive the tumbling to produce tumbled stones that display nasty fractures. You don't want to spend a month to produce these. Examples of nicely polished garnets with ugly fractures are shown in the accompanying photograph. INCLUSIONS: Much garnet has inclusions of other minerals. These minerals are often softer than garnet or not as tough as garnet. In a rock tumbler included minerals softer than the rest of the rock will over-cut and produce deep pits in the surface of the stone. Also, in a rock tumbler, included minerals that lack toughness often break, fall free from the rock, and leave deep pits in the surface of the stone. Even if the inclusions are very tiny, there are often enough of them to disrupt the garnet's ability to reflect light across its entire surface - and the ability to reflect a lot of light -- without a lot of pits interrupting it -- is what gives superbly tumbled stones their beauty. 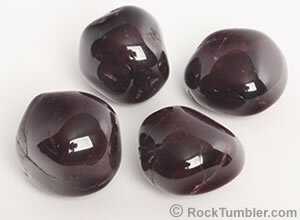 Four nice almandine garnets with a superb polish and without the pits and fractures that plague most tumbled garnets. These garnets are about one inch in diameter. The line between "tumbling grade" and "below tumbling grade" varies from one person to another. Some people are really picky and only want super-perfect stones. Other people don't mind stones with some blemishes (cracks, pits, inclusions). Some people even enjoy these stones because they believe that the imperfections give the stone "character". Sometimes, a little more tumbling will grind away some imperfections and turn a really ugly stone into a slightly smaller, but much more beautiful stone. But, with garnet, a little more tumbling usually reveals deeper inclusions and deeper views of those same ugly fractures! 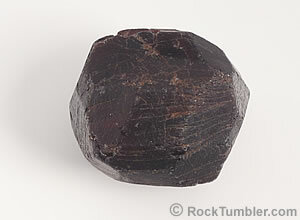 Garnets with a spectacular polish but plagued by large, unsightly internal fractures. These stones are about 1/2 to 1 inch in size. 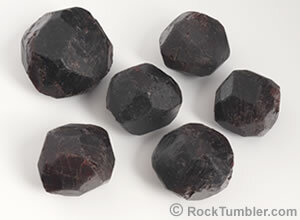 If you are interested in tumbling garnets, examine them carefully. Look for fractures that intersect the surface of the material. These fractures will cause a blemish on the surface, but if your garnets are gemmy and transparent, you will see the fracture plane as an ugly subsurface blemish. Much garnet is so intensely fractured that it will not make nice tumbled stones - unless you want pea-size or smaller stones. Inclusions are harder to detect. However, if your garnets are from metamorphic rocks such as schist or gneiss, it is rather safe to assume that they contain a lot of inclusions. Why? These garnets grew within the rock instead of within a cavity and that is a dirty environment for crystal growth. Some gemologists say: "Mother Nature cooks in a dirty kitchen!" This is a microscopic view of a garnet crystal that grew within schist. The large black grain is the garnet, the red elongate grains are mica flakes. The black, gray, and white grains are silt-size grains of quartz and feldspar. The garnet crystal grew by replacing, displacing, and including mineral grains in the surrounding rock. You can see many of these grains as inclusions within the garnet. From this photo it is easy to understand why gem-quality garnets are very hard to find. Photo by Jackdann88, used here under a Creative Commons license. 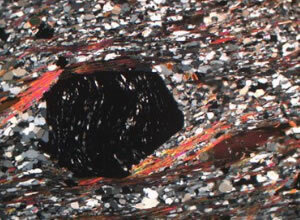 The accompanying photo shows an extremely thin slice of garnetiferous schist mounted on a microscope slide and viewed in cross-polarized light. The large black polygonal shape is a garnet crystal (garnet is an isometric mineral and does not transmit light under crossed polarizers -- but included quartz grains do). Look closely at the garnet crystal and you will see tiny gray and white particles. These are tiny, silt-size grains of feldspar and quartz that were included as the garnet crystal grew. They were not completely replaced or pushed aside by the growing garnet crystal. Today they are inclusions in the garnet. If the garnet crystal in the photo was polished in a rock tumbler it would likely exhibit lots of tiny pits - one at each location where a surface-reaching quartz or feldspar inclusion was exposed. These gemmy pieces of garnet are from the Barton Mine, Gore Mountain, Warren County, New York. They range from about 1/2 inch to about 3/4 inch in size. Gore Mountain garnets were first mined in the late 1800's. They were crushed into sand-size pieces, screened into size fractions, and the abrasive granules were used to make sandpaper. They have also been used to produce beautiful deep red faceted stones, cabochons, and tumbled stones. Gore Mountain garnets are the official state gem of New York. Where to Find Tumbling Grade Garnet? The answer to this question depends upon how picky you are about your tumbled stones. If you are satisfied with the fractured and pitted garnets in the photos above then your definition of "below tumbling grade" is different from ours. We don't like the fractured and included appearance so we avoid those materials. If you want to be relatively safe buying tumbling rough online, look for sellers who tumble their own rough, show photos of their results, and share the methods used to produce the stones in the photos. A lot of rough is sold by people who know little to nothing about rock tumbling, they simply buy colored rocks by the ton and sell them to you by the pound. The gemmy pieces of garnet in the accompanying photo are from the Barton Mine in Warren County, New York. You can visit the Barton Mine to collect your own garnets. The owners will allow you to enter the mine and search for garnet for a small fee. The mine is listed in the New York section of our fee mining sites page. You can also read about a field trip to the Barton Mine in an article on the Rochester Academy of Science website. You can also see one of the most incredible mineral localities in the world in a photo on the New York Department of Conservation website. Those red, soccer-ball size features in the quarry wall are garnets. It is unlikely that you will be able to find a big chunk of that material to bring home - but you might find some fist-size pieces with dime-size garnets. However, if you look at the ground you will see that it is littered with red particles. Those are tiny garnet chips that will make very gemmy but very small tumbled stones. You can prospect these chips and find tumbling grade material. However, it is in pieces that are about 1/2 inch in maximum dimension or less. Most of the garnet at Barton Mine is cross-cut by parting planes that have a spacing that is usually less than 1/4 inch. That limits the size of tumbling grade material. Tumbled stones made from green grossularite garnet from South Africa. The larger pieces are about one inch in maximum dimension. People call the material "Transvaal Jade" because it has the appearance of jade - but it is garnet. Want some? Most people think of garnet as a red transparent gem material. 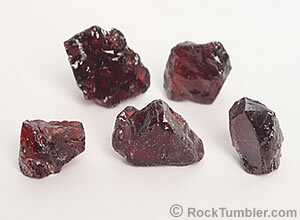 Most of it is a deep red with a tone that is so dark that the garnet is almost opaque. A completely different garnet is the fine-grained opaque garnets such as granular grossularite, shown in the accompanying photo. This material is composed of such fine-grained garnet that it has a sugary texture on broken surfaces. Most people are surprised to learn that it is really garnet. Many people call it "Transvaal Jade" because its green color and markings have caused many people to think that it is jade. 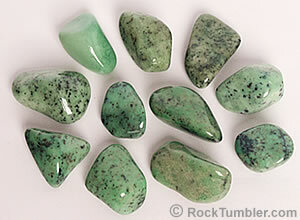 We sell tumbled green grossularite on our tumbled stones page. 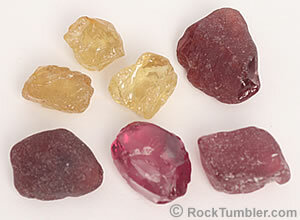 Small, but colorful and very nice pieces of garnet that will make gemmy tumbled stones. .
We rarely tumble garnet. Rough that can produce good tumbled stones is usually really small in size, really hard to find, and really expensive. You can pay a few dollars for a few small pieces. It is the same rough that many people buy for cutting cabochons. The pieces of rough in the accompanying photo are small (one to three grams each) but will produce gorgeous tumbled stones. You must examine the rough carefully, be picky about what you purchase, and realize that tumbling grade garnet will probably cost more than most other tumbling roughs. Collecting Garnet: If you visit a location where garnet crystals can be found, examine them for fractures and included materials. Collecting rough crystals from a stream gives you an opportunity to see clean material and a stream-tumbled surface. In stream-tumbled rough, fractures are easier to see and pieces with problematic inclusions will sometimes be obvious. Be picky in your collecting and leave questionable pieces behind. Purchasing Garnet: When buying any type of tumbling rough, being able to handle the material and view it from many angles gives you the best opportunity to know you are buying "tumbling grade" material. That isn't possible when you are buying online or when you are buying bulk bags in a store or at a show. When we buy rough we usually buy a small amount, see how it performs, and then make a decision to buy more or try something else. 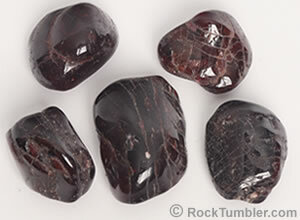 Much of the "garnet tumbling rough" sold online is below tumbling grade, in our opinion. When we do find garnet that we consider tumbling grade, here is how we tumble it. If it is smooth and in small pieces we simply include those pieces while tumbling a batch of jasper or agate. If the pieces are small and already smooth, we add them to the agate/jasper starting at the medium grit step and allow them to progress through fine grit and polish with the agate or jasper. We have obtained great results polishing garnet with TXP aluminum oxide polish. If the pieces are broken and angular and we paid a lot for them, we will preshape them on a diamond grinding wheel, under a water spray. That is the best way to conserve material and start tumbling with nicely-shaped preforms instead of allowing (or hoping) the action in the tumbler will do a good job.